The Events Manual plugin is great for creating custom events and keeping people up to date about your events, schedules, and happenings. What is the Events Manual plugin? The Events Manual plugin is a great way to keep people up to date about your events, schedules, and happenings. 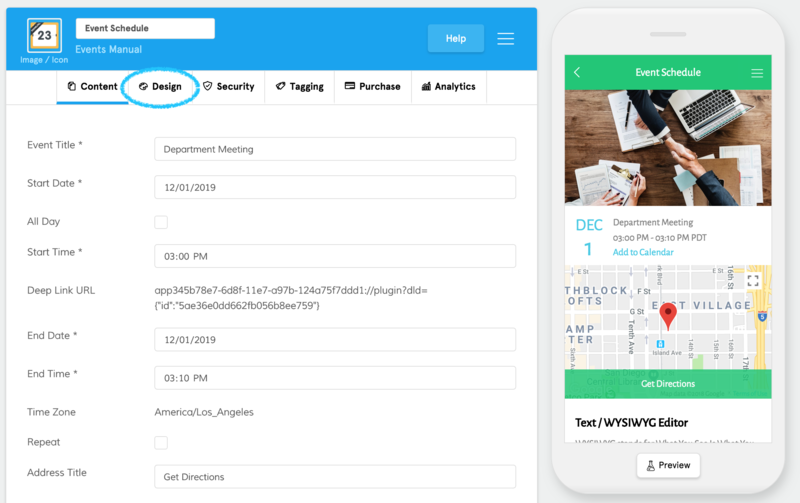 It allows you to display calendar events for your users and manually customize them with a title, description, and even embed images, video, forms, and more with the built in text wysiwyg editor. Using this feature is particularly useful if you have information you don’t want to make available to the general public through a public calendar. What are some use cases of the Events Manual plugin? Church/Non-Profit apps: give your community detailed event information about service times, classes, and outreach opportunities. What are the Event Manual plugin’s primary functions and what are the steps to accomplish them? The Events manual plugin provides some amazing functionality as described in the introduction, but read on to see what some of the core features are and how to set them up. Here are some simple steps get this feature live on your app, but if you’d like more detailed information, we’ve written a dedicated article about how to create and enable Marketplace features. Once you've added it, you can change the feature's icon and title, which will be what your users see when they access it in your app. 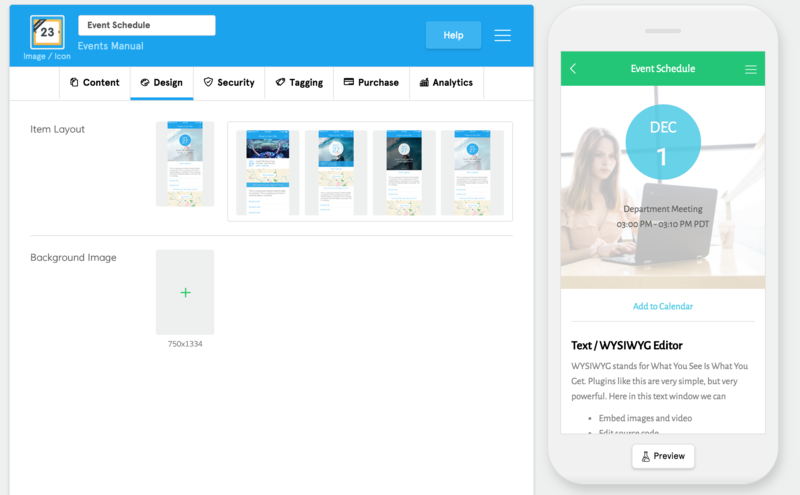 Step 4: Once you’ve created your content, you can make your feature accessible by adding it to a Folder plugin, the side menu, or the footer menu. This is optional, of course, but it helps to give a higher quality look to your app. And with our stock images, you can find a beautiful image in no time. 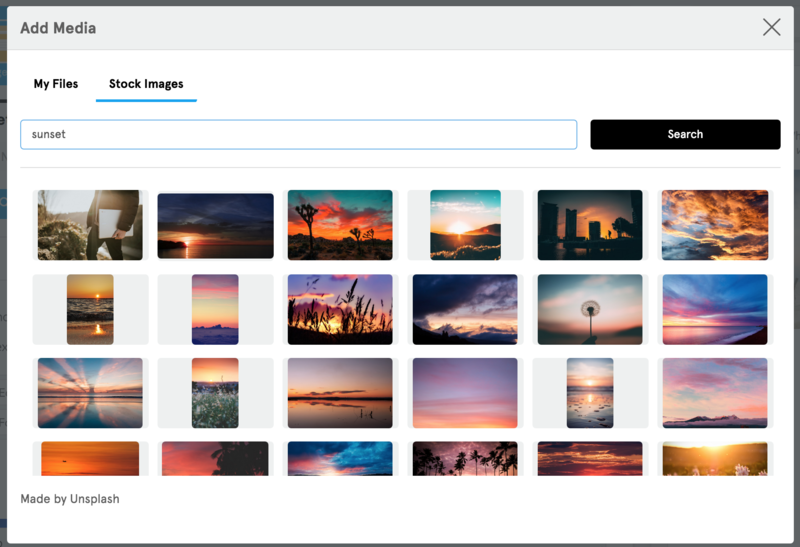 This too is optional, but you can link your images to actions such as calling a phone number, sending an email, linking to other app content, and more using the action builder. Since this is a core component, we’ve created a dedicated article about how to use the action builder here. This is what your users will see in the list view of your events. The following fields will give your users the necessary information regarding your event, such as the event title, start and end date and time, location, a detailed description, and contact links. 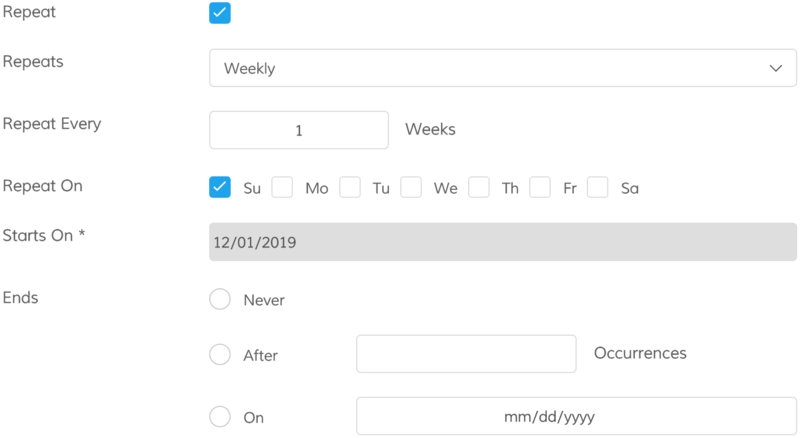 If this is a repeating event, click the checkbox for “Repeat” and choose from the options such as how often it repeats, how many times it repeats or if there is a date on which it stops repeating, and more. For the location, you can override your actual address or coordinates by entering text into the “Address Title” field. The Security tab is a core component that is utilized across several features to streamline your user experience. With it, you can make exclusive content by requiring that users login to access it. You can also restrict content to specific users by requiring that they have a tag, or tags, attached to their profile. Since this is a core component, we’ve created a dedicated article about how to restrict content using the security tab access settings. If you have a calendar that produces an iCal feed (most calendars do since it’s an industry standard), you should check out the Events Feed Plugin. High quality images that represent the event you’re promoting can have a great impact on how people perceive the event. You can create your own graphics or choose from a variety of stock images in our Media Library. With our text wysiwyg, you can link out to registration pages or even embed the forms right in your app. Let’s face it, sometimes your audience needs a little push to take action or be reminded about an event. With Push Notifications, you can do exactly that.